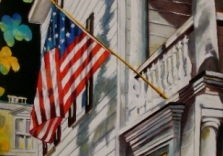 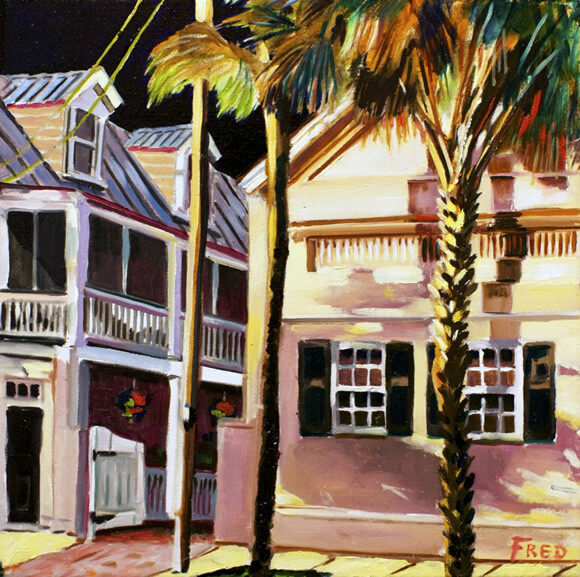 Fred Jamar says, "Like many of you, I have been many things: A boy scout, a college student, a military police lieutenant, a lab analyst, a merchant marine officer, a bank vice president and a painter. 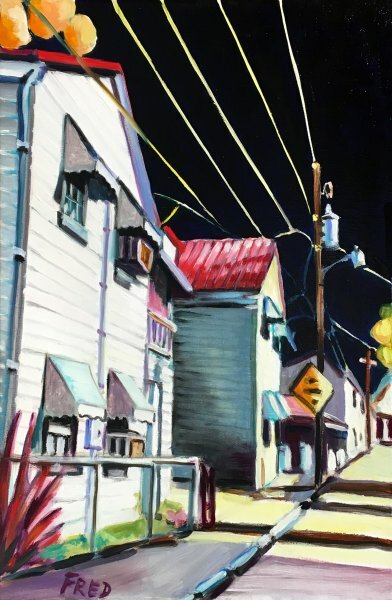 Like most of you , I have well enjoyed these things but should I be given the opportunity to start my life over again, I would concentrate all my energy solely in one direction and be a painter." 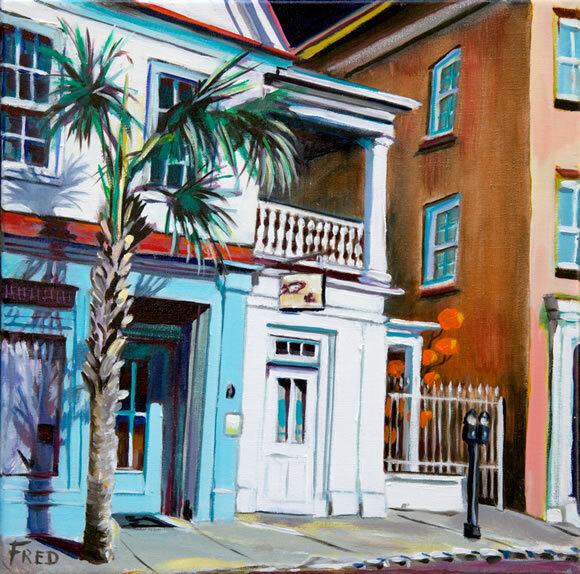 Fred Jamar has brought a new infusion of intellect and energy to Charleston's art scene. 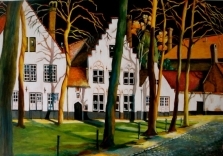 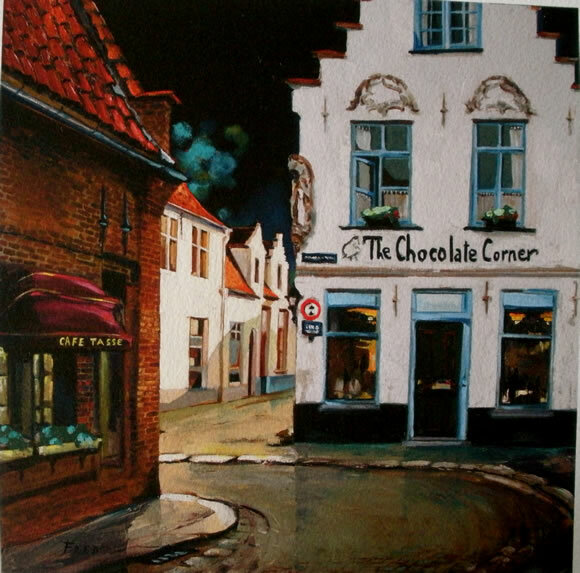 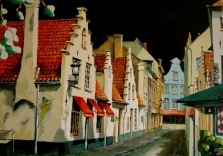 Born in the village of Stembert in Southern Belgium, near the site of the Battle of the Bulge, he has been a world traveller through most of his adult life. 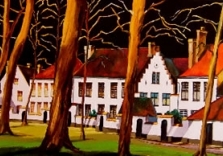 After graduating with honors from the Belgian Maritime College - he was valedictorian - and three years at sea, he studied finance. 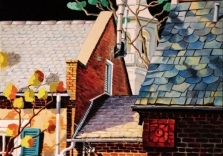 With an MA-equivalent degree, he joined J.P. Morgan & Co, where he helped to found a clearing house for Eurobonds in 1967. 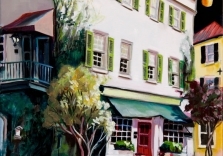 That organization has grown from its initial cadre of five to become a European bank with over 2,500 employees. 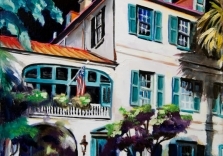 Staying with Morgan, Fred worked in a sector focused on global credit exposure - a crystal-ball activity analyzing nation-by-nation and industry-by-industry credit risks. 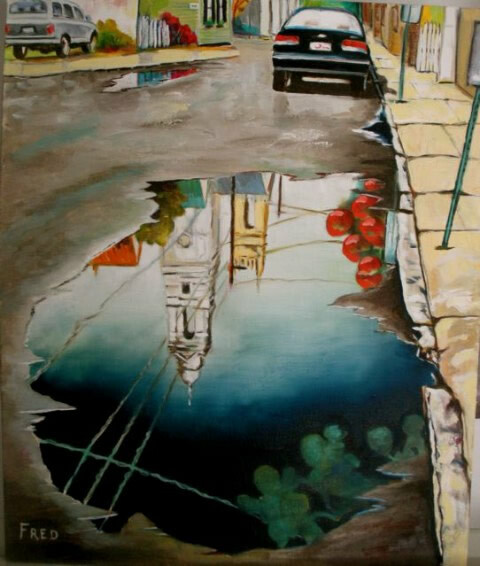 He covered the globe. 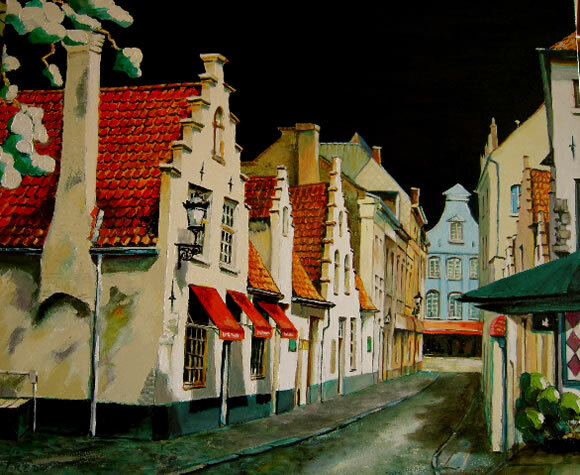 He has lived in Brussels, Paris, London, Frankfurt and New York. 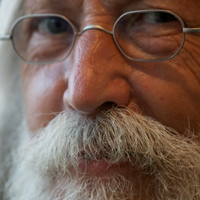 There are no continents and very few countries he has not seen. 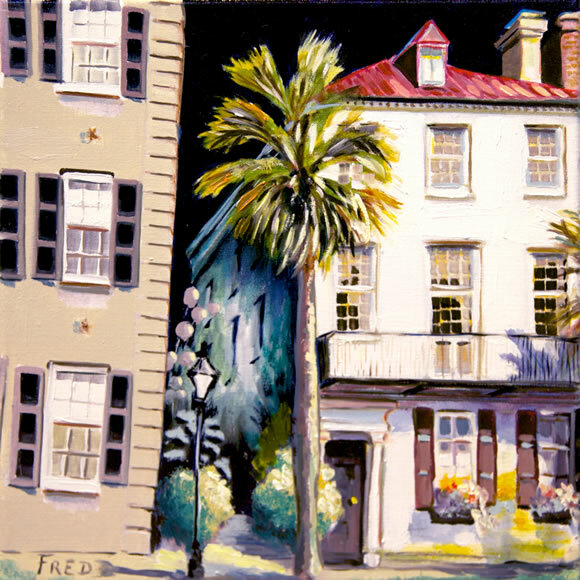 In the early 1980's Fred was based in the United States, and chose Kiawah as a favorite family vacation spot. 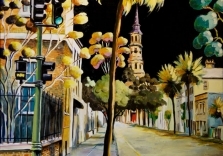 That led to a solid acquaintance with Charleston. 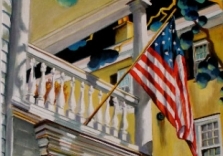 When the time came to take early retirement in 1997, he chose to settle here "in the most European of American cities." 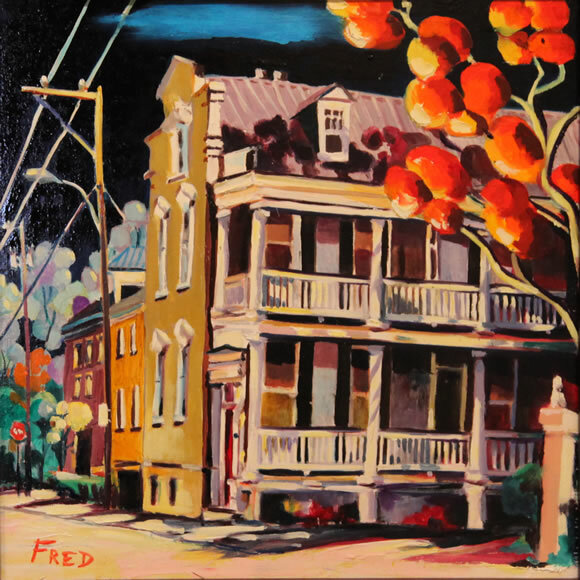 Central among Fred's many interests is a lifelong love of painting. 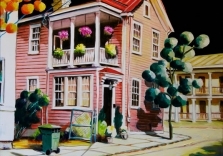 When he was a small boy, his mother would sometimes paint little floral scenes and give them to her children. 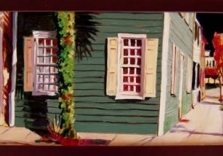 he also had a neighbor who created backdrops for theaters. 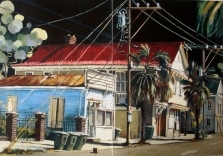 Stimulated by these and other examples, he developed a great zest for artistic creation. 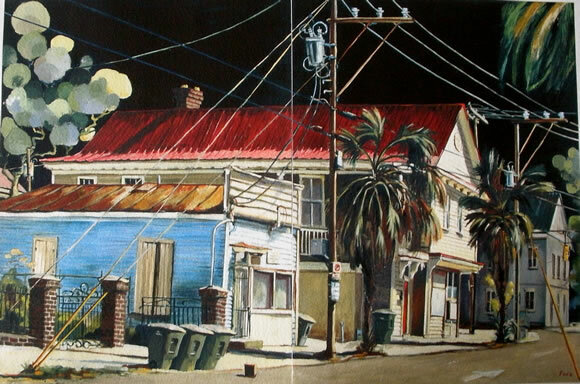 As a child, he would paint on bed sheets, on cardboard, anything flat. 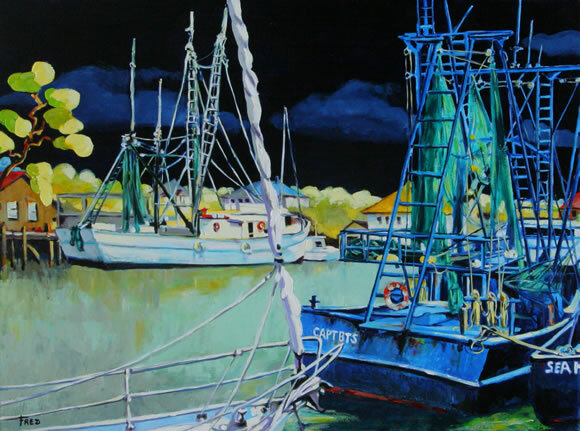 In the Merchant Marine, he used discarded tarps from the engine room. 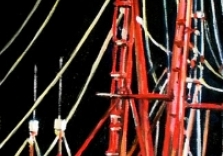 To this day, he enjoys process more then product. 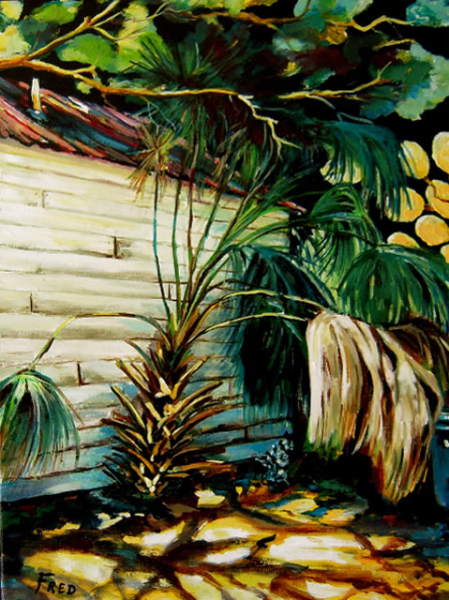 The smell of the oils and turpentine, the texture of the canvas, sensuality of brushes and paint are more important to him than any result. 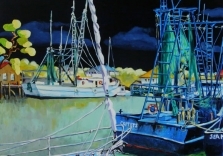 He is enormously prolific, with over 90 works completed in the past year alone. 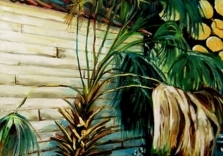 He is also successful. 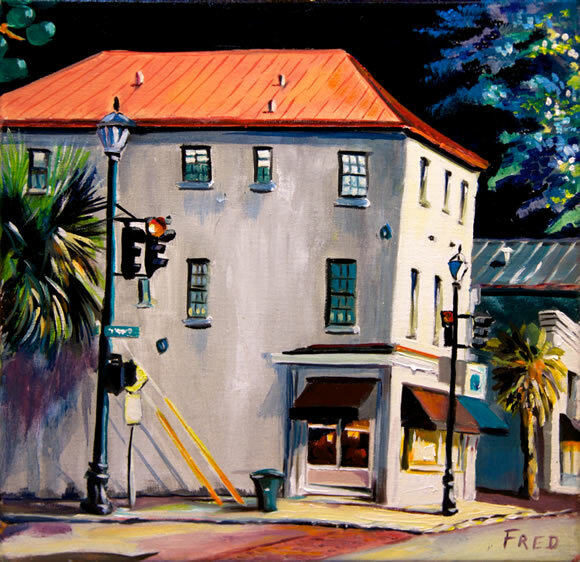 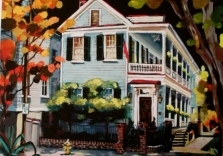 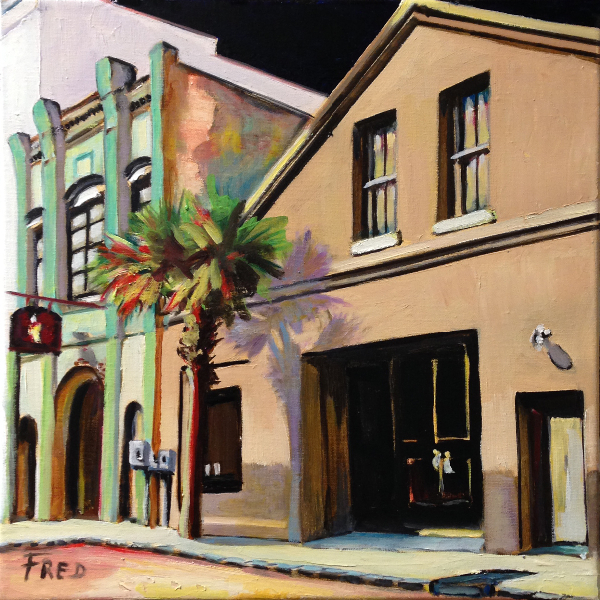 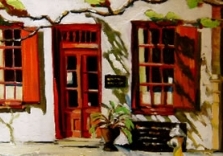 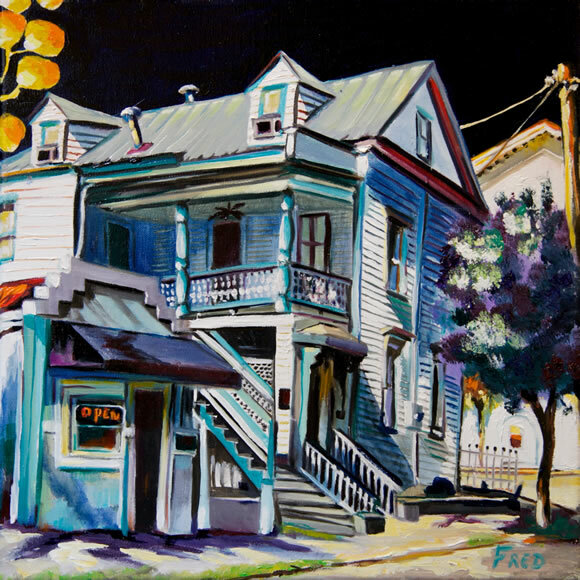 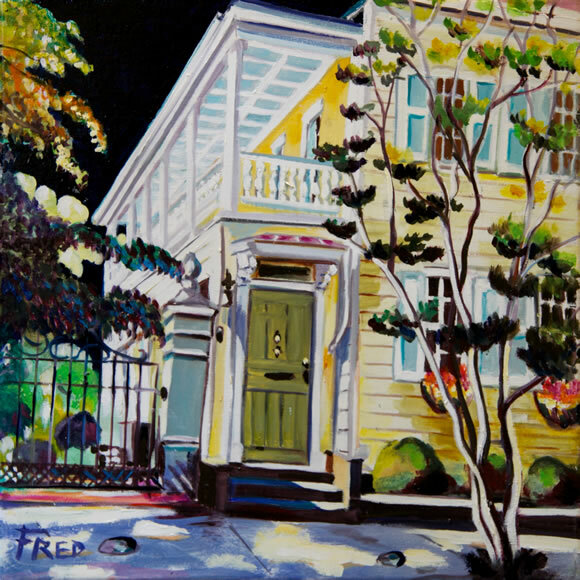 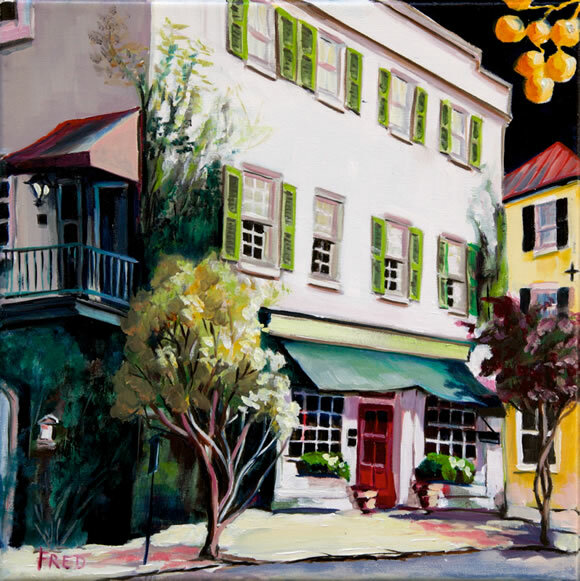 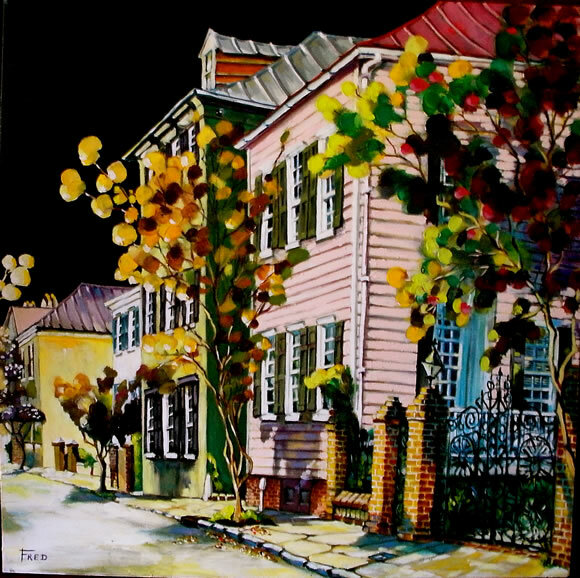 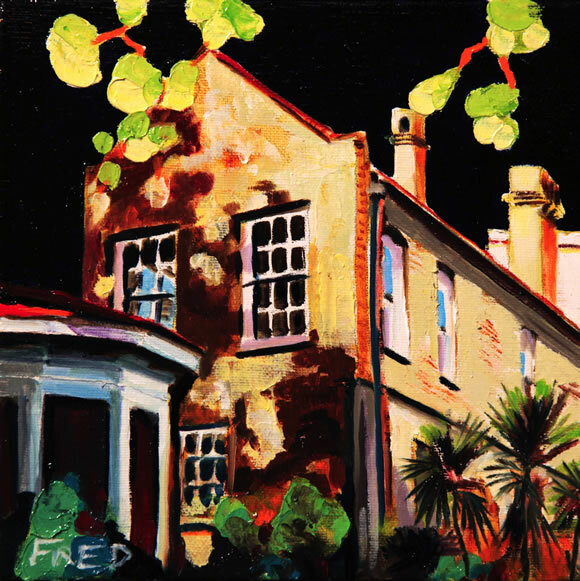 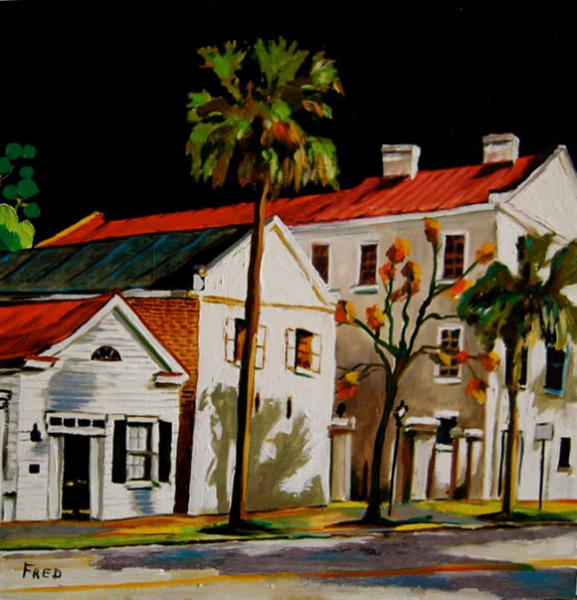 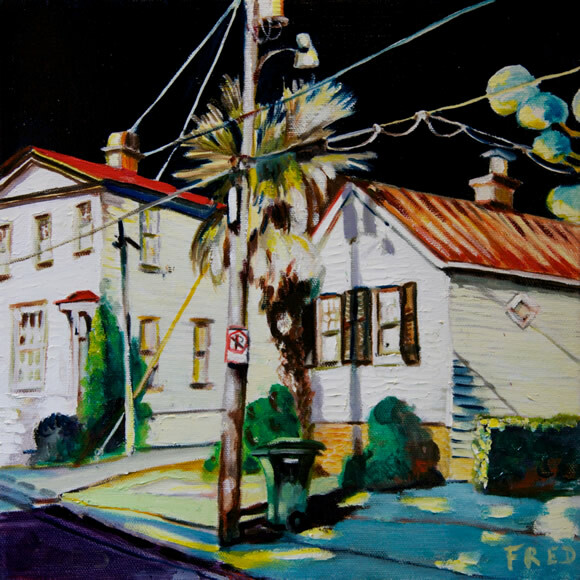 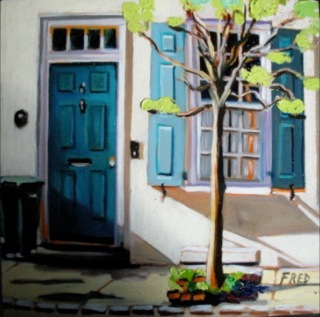 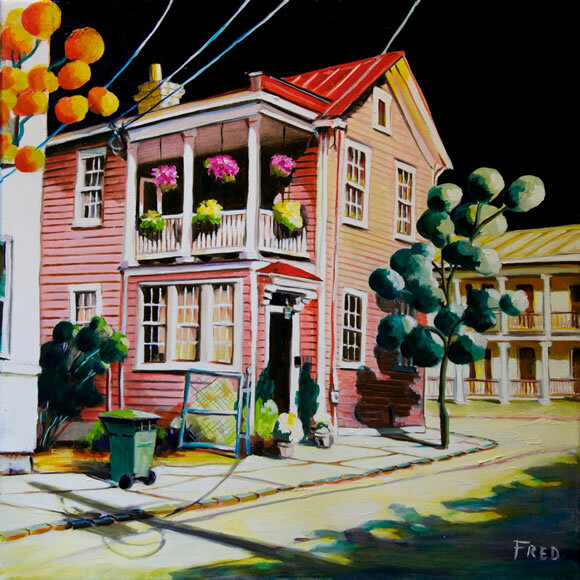 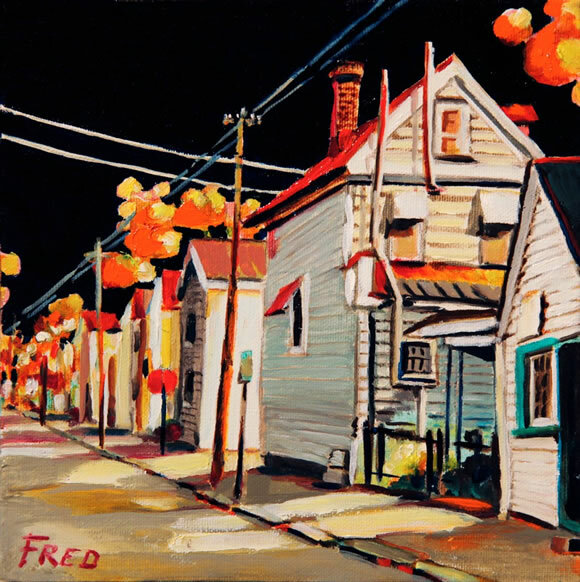 Fred has had several solo exhibitions at local galleries, and has been selected as an exhibiting artist with the Charleston Artist's Guild. 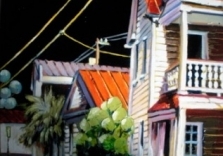 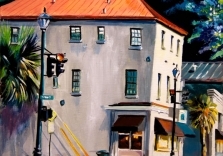 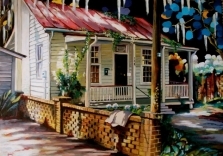 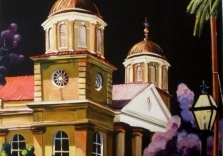 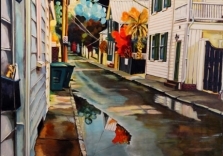 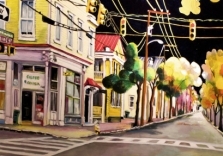 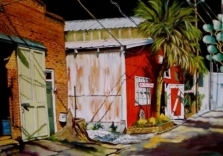 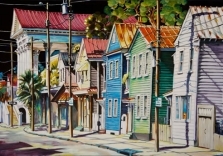 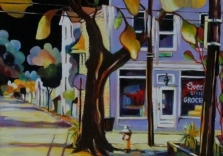 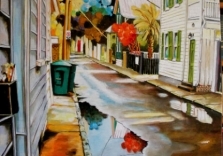 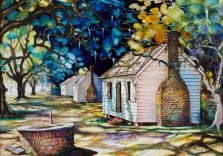 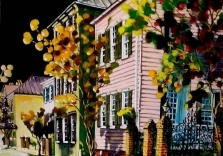 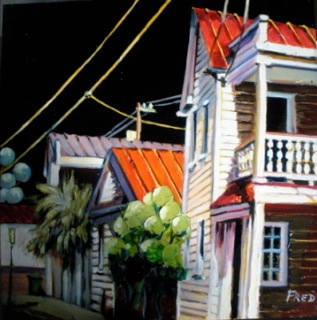 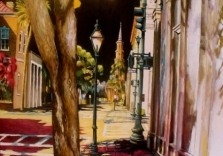 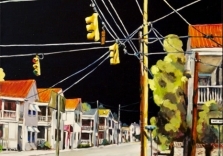 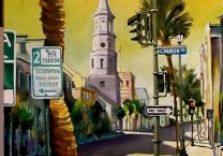 In 2002 he won the Cooper River Bridge Run Design Competition, which greatly expended his regional exposure, and was juried into his first Piccolo Spoleto exhibition. 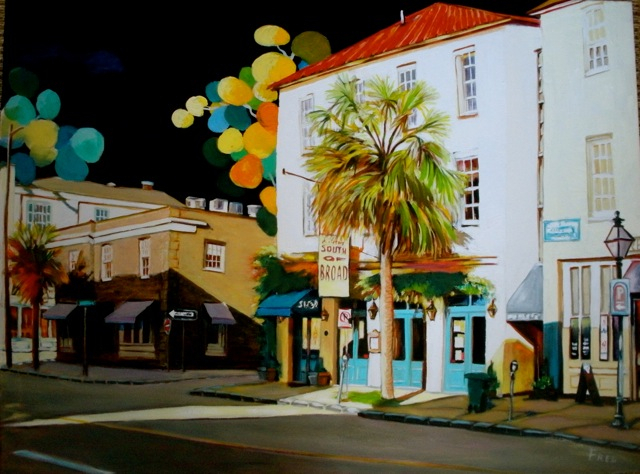 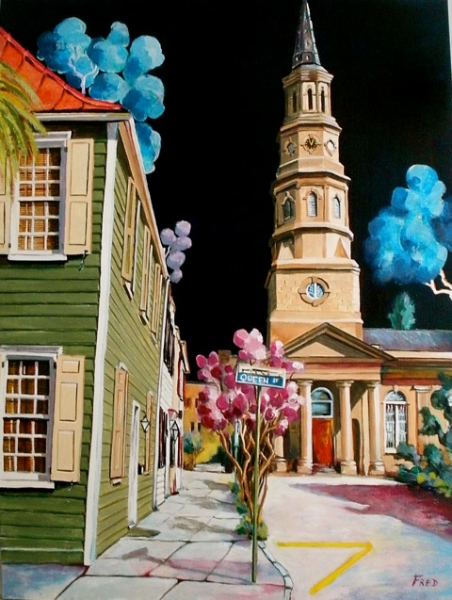 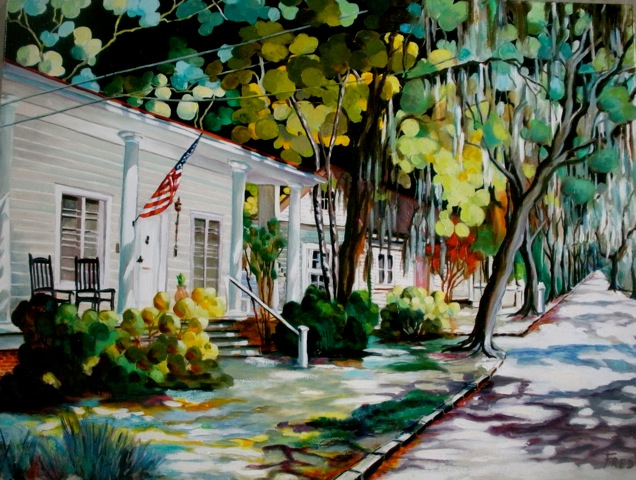 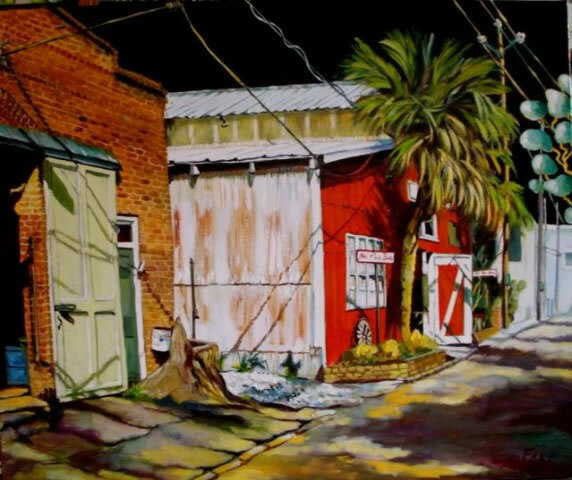 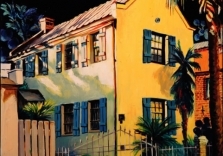 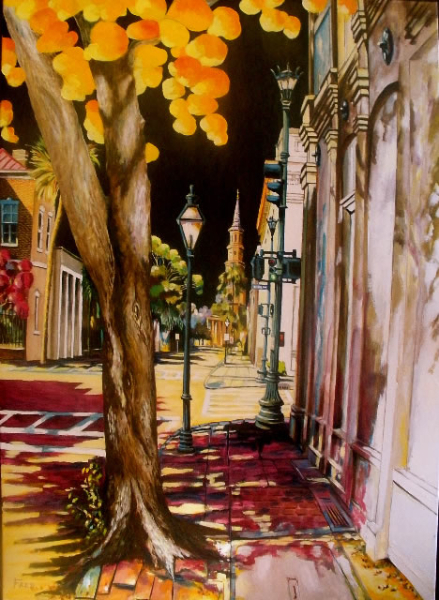 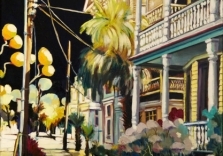 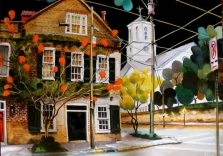 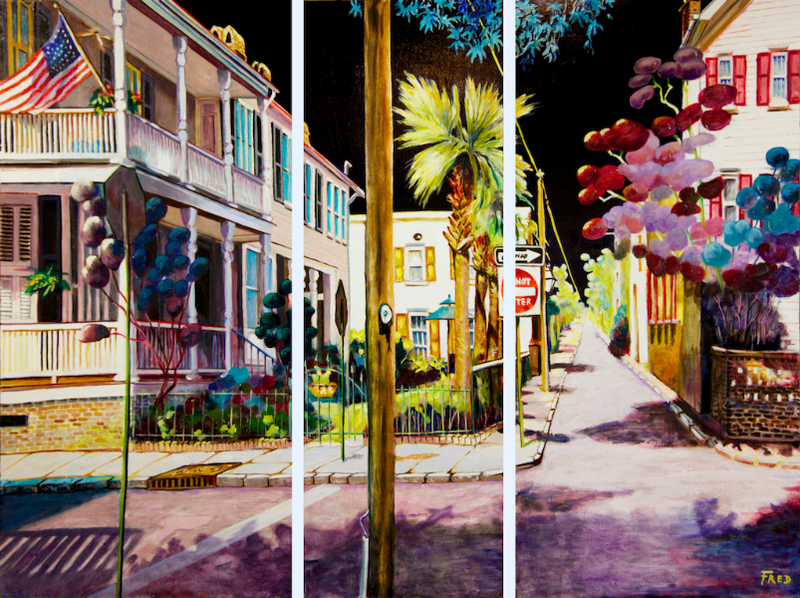 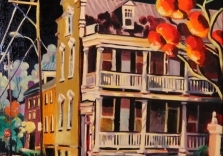 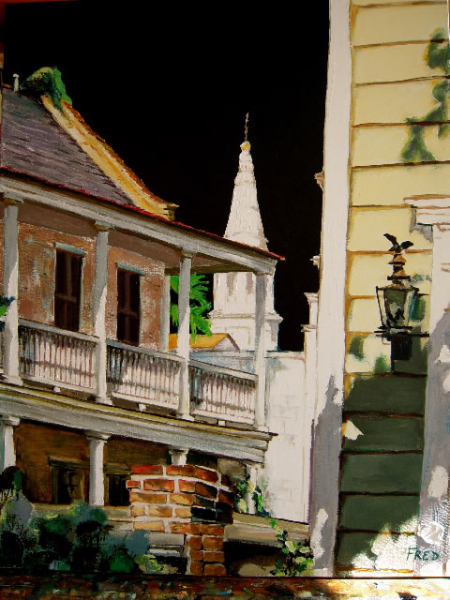 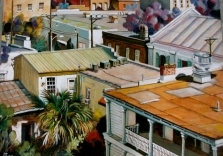 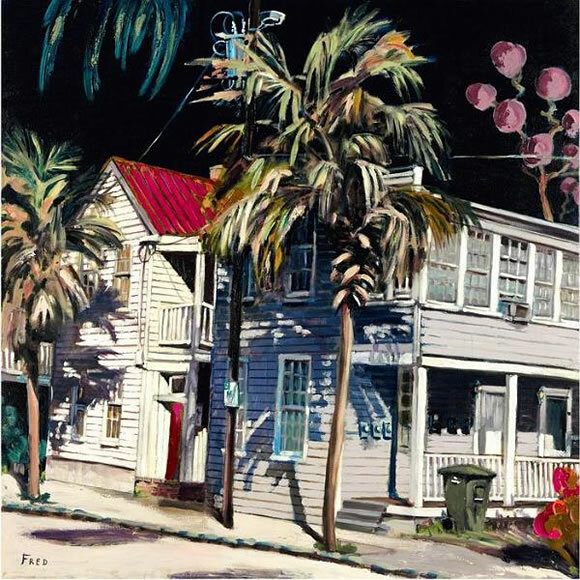 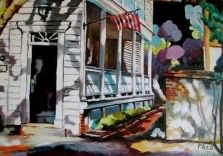 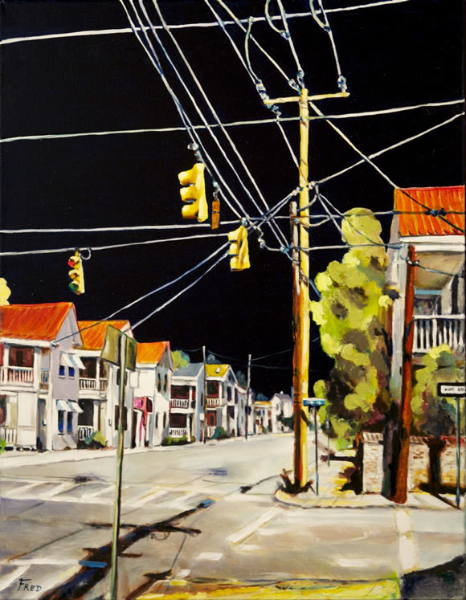 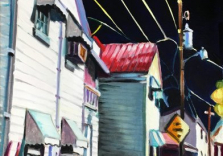 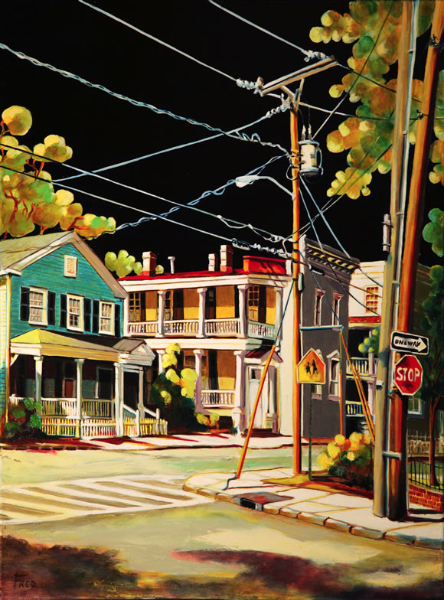 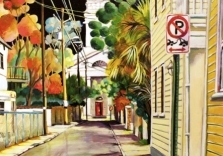 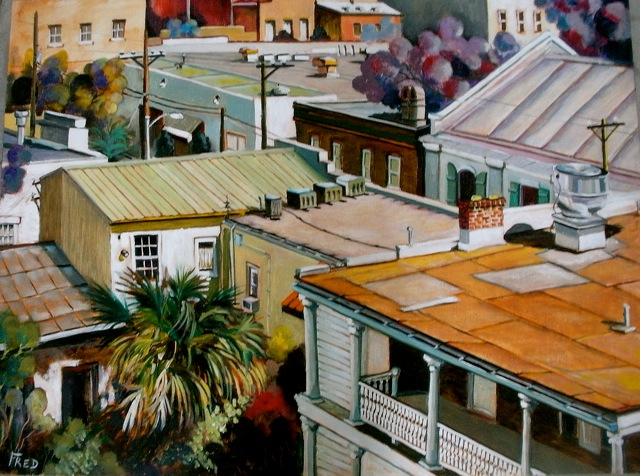 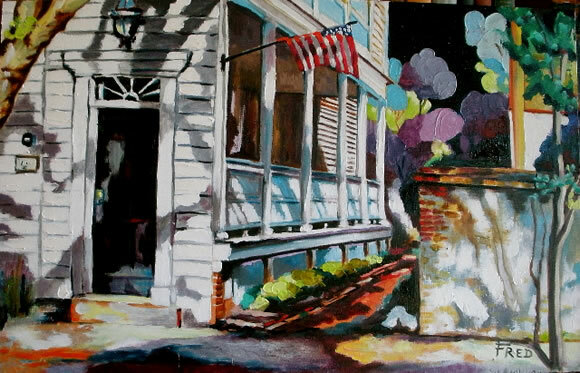 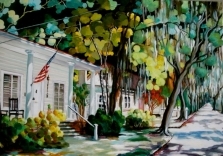 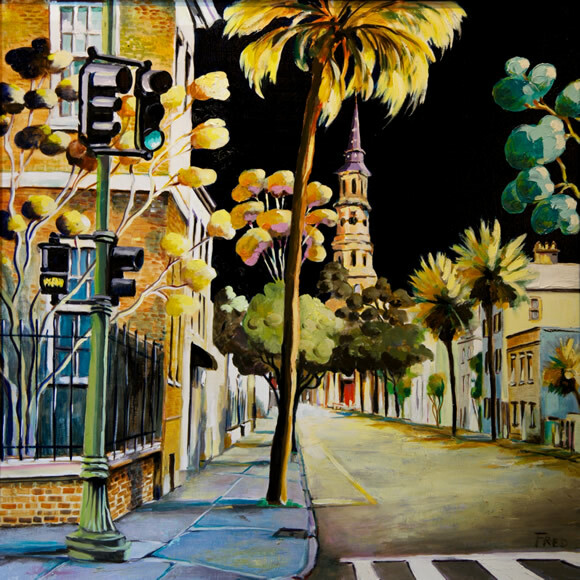 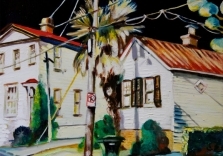 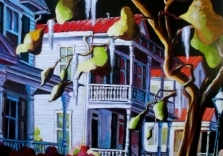 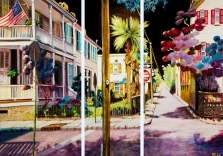 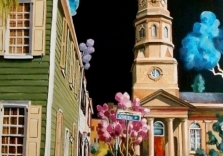 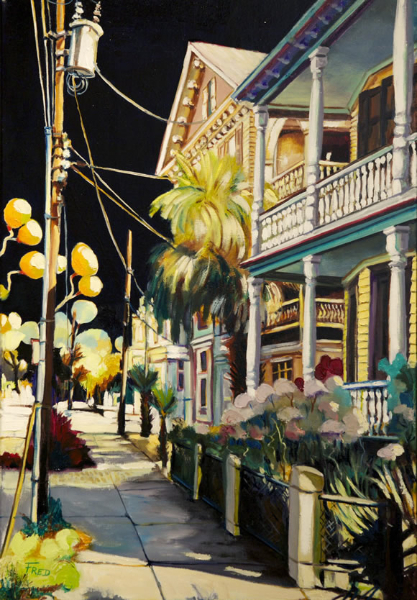 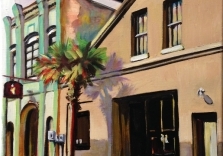 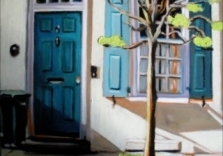 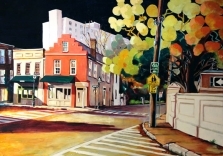 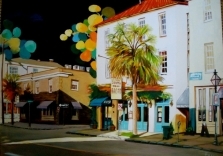 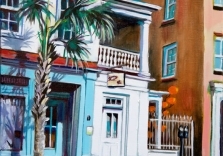 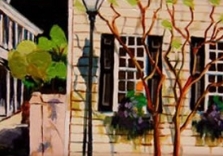 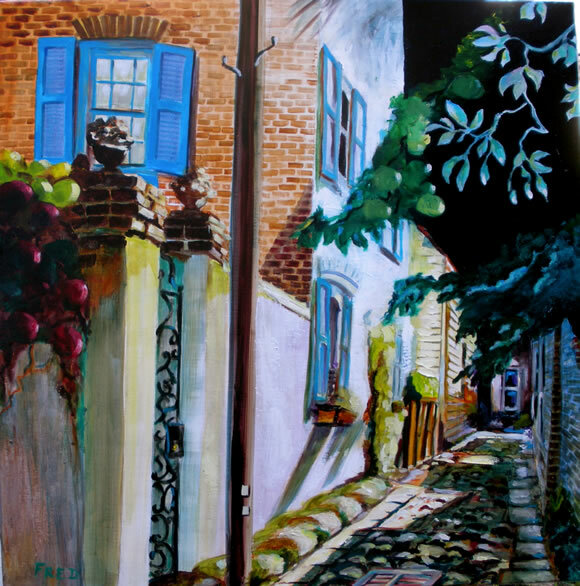 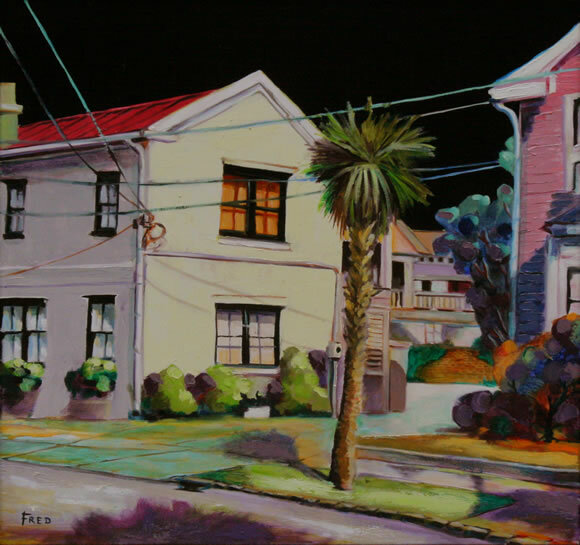 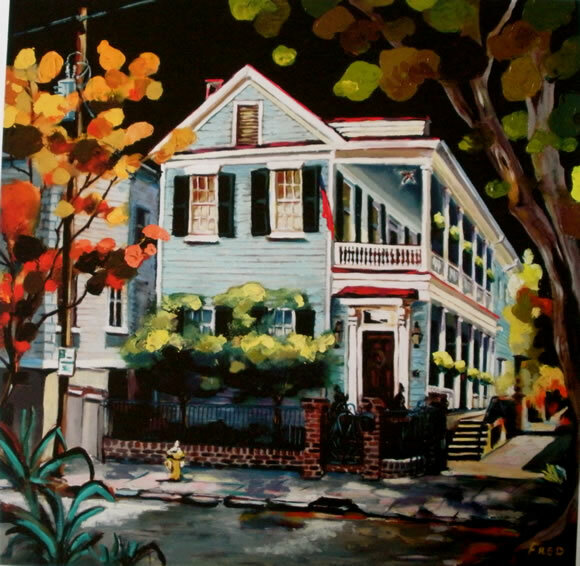 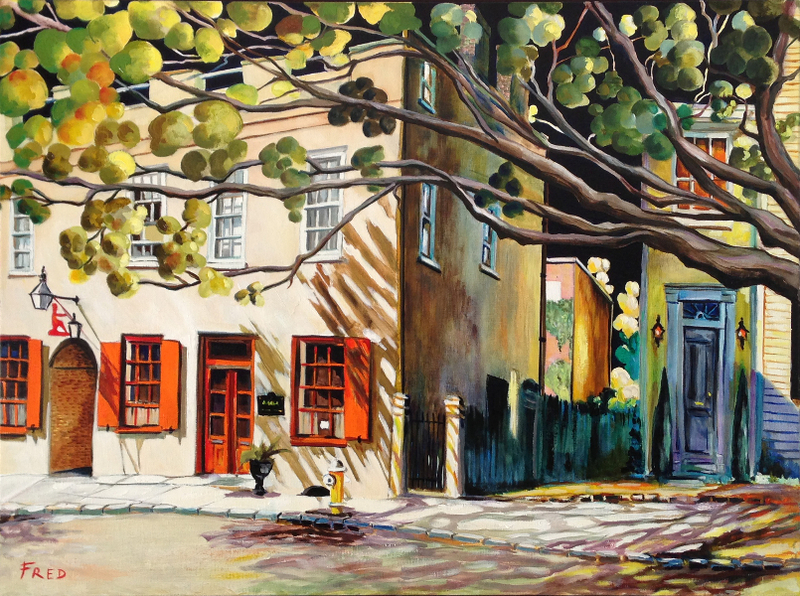 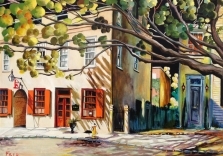 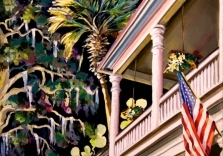 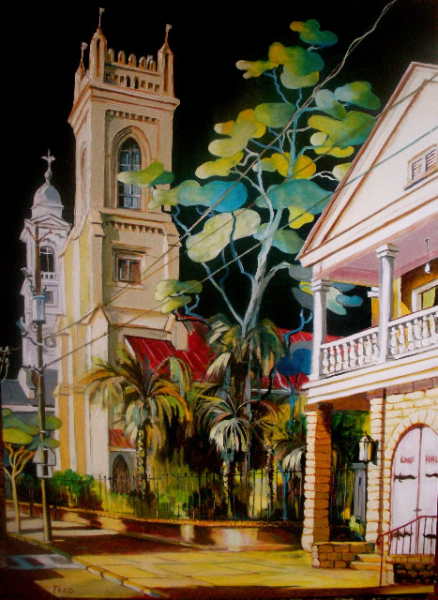 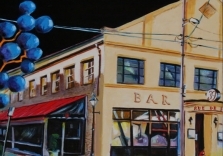 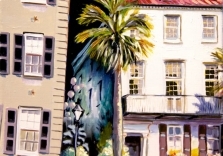 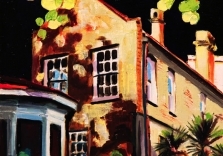 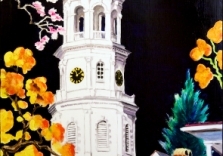 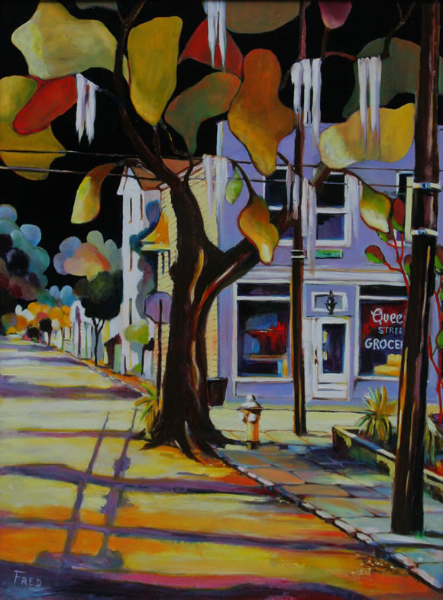 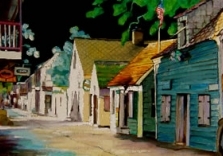 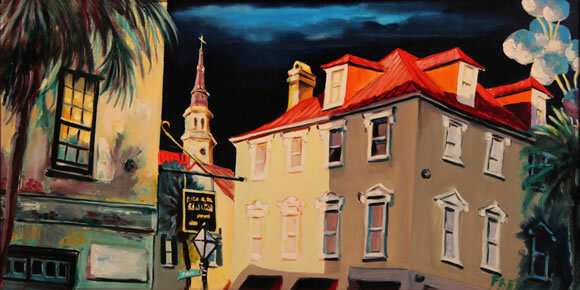 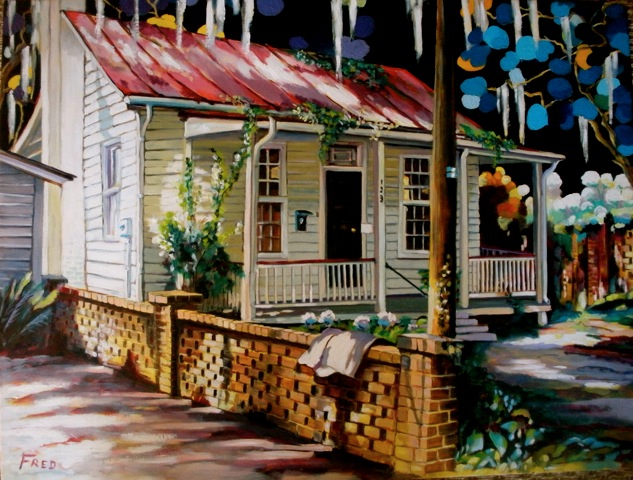 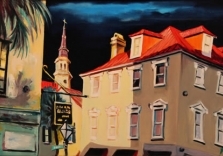 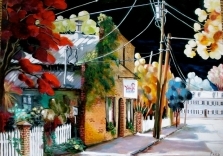 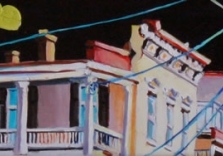 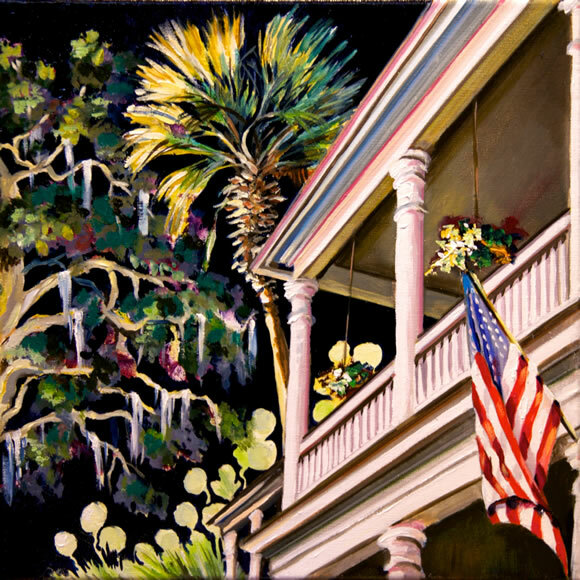 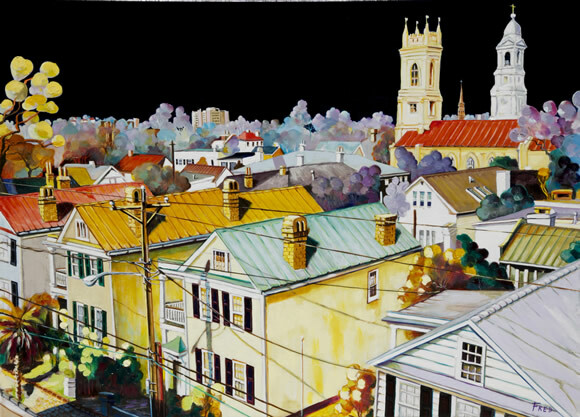 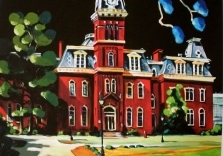 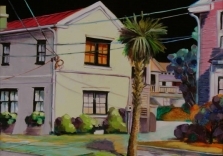 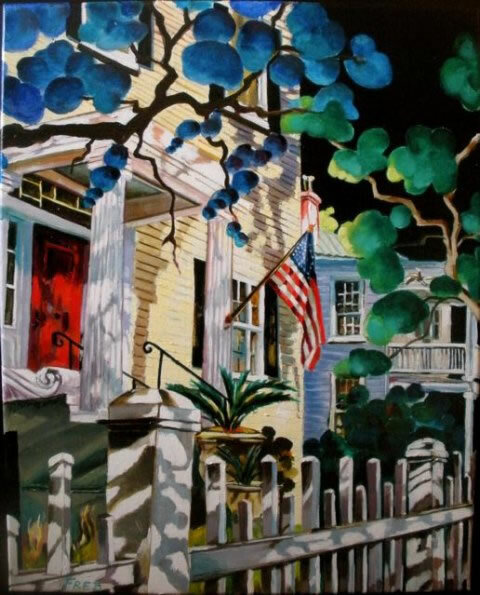 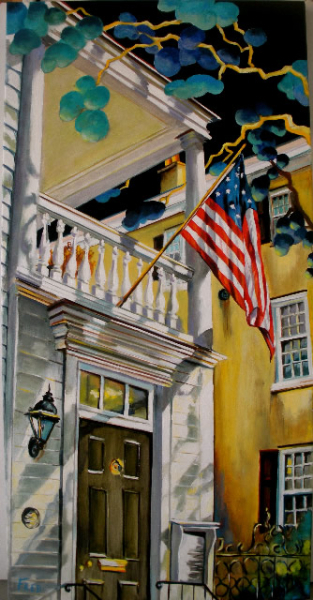 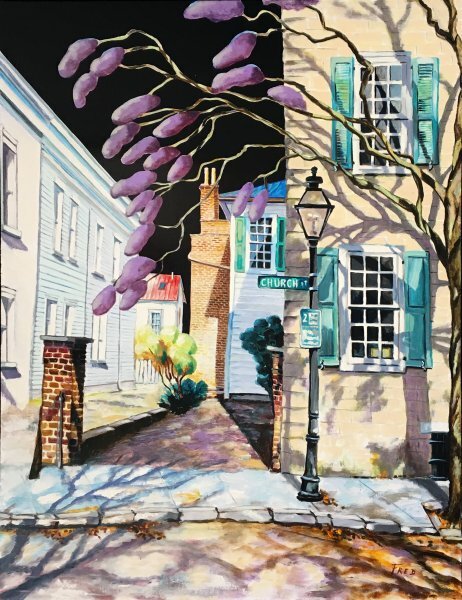 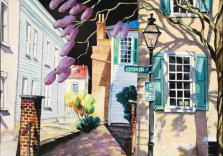 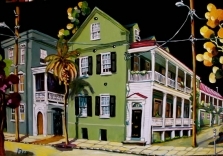 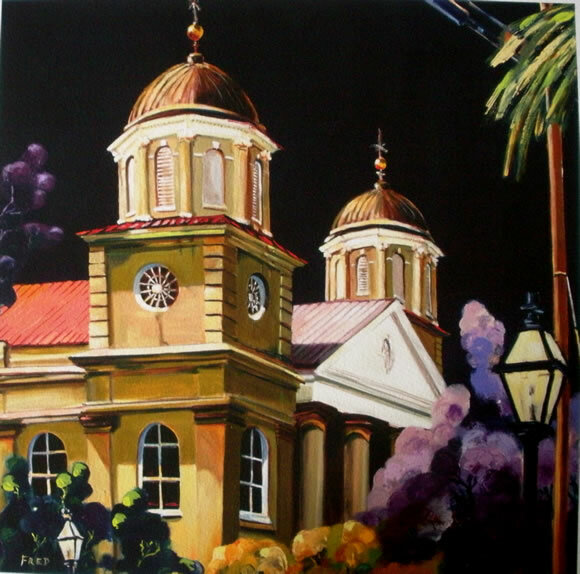 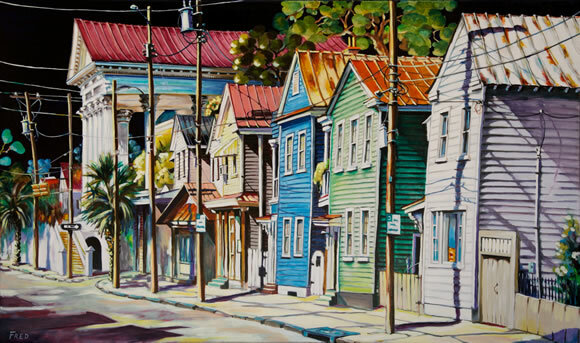 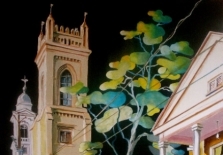 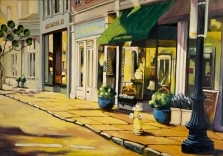 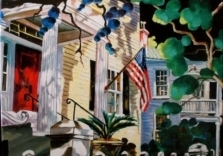 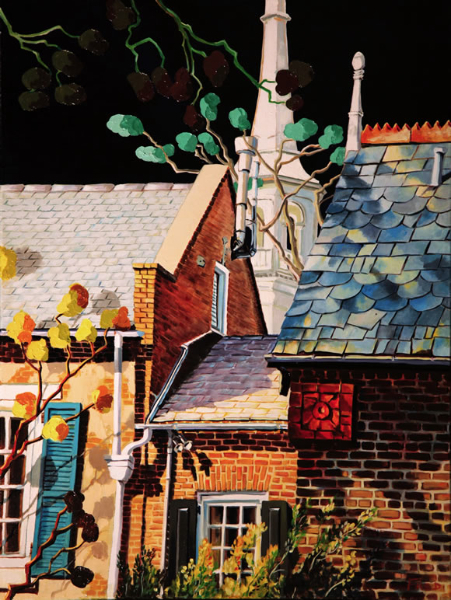 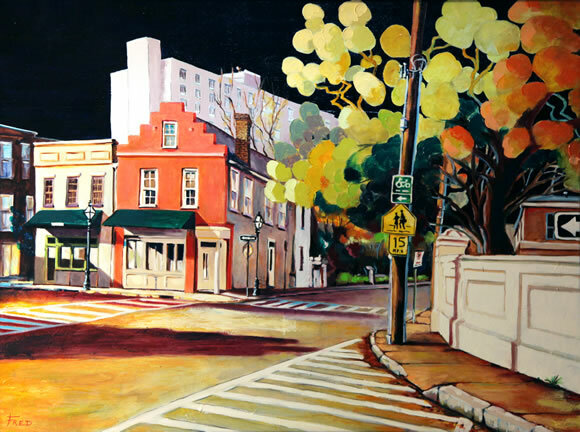 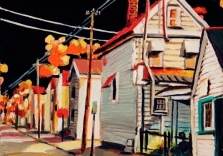 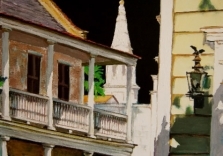 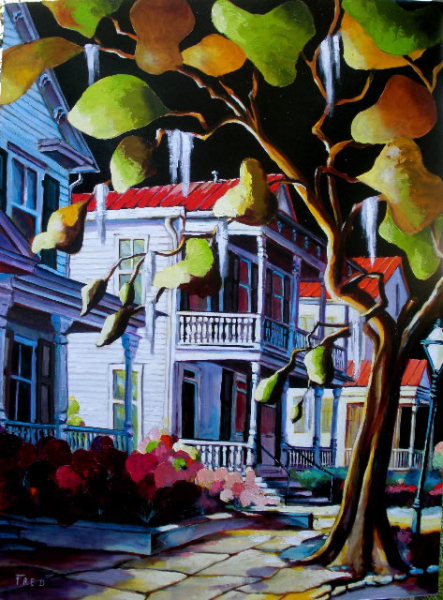 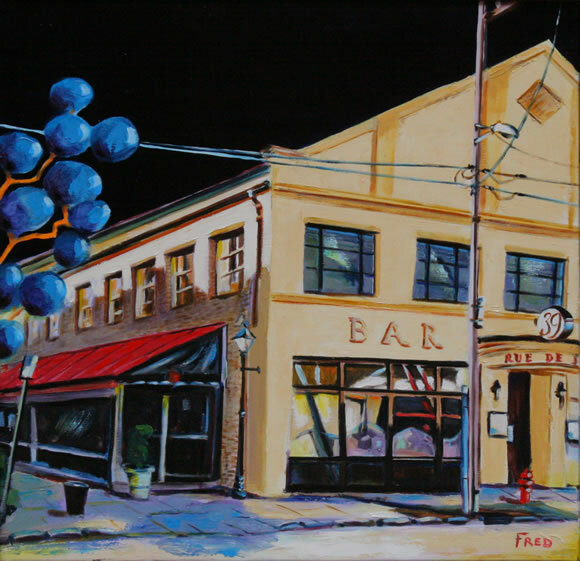 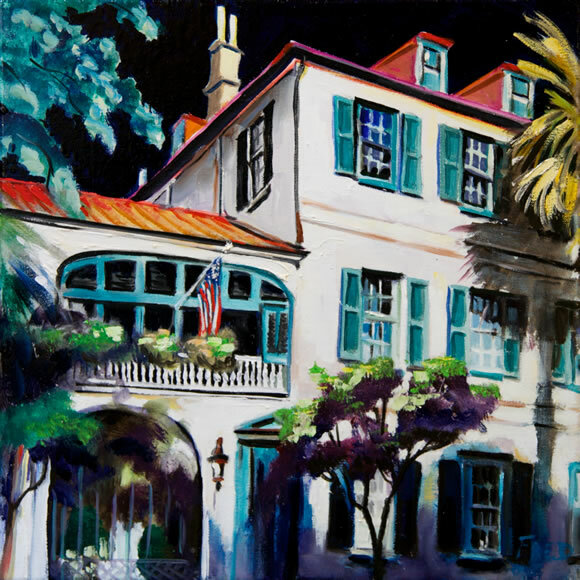 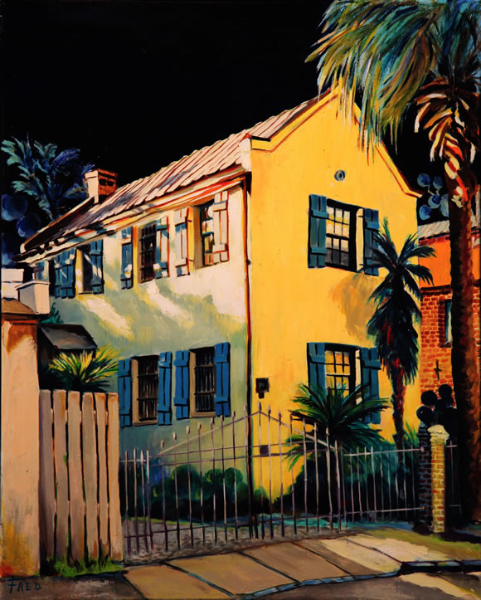 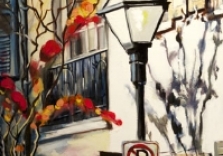 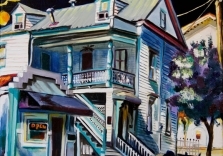 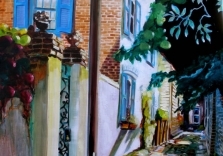 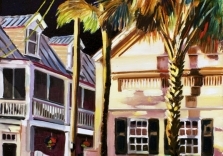 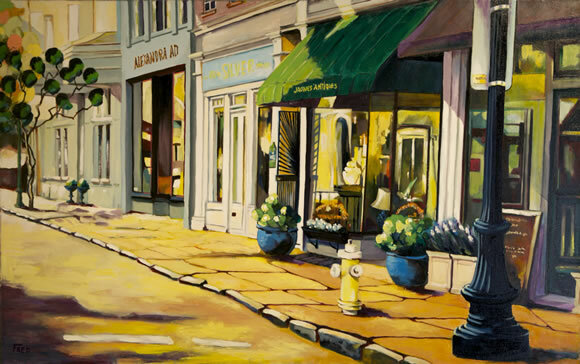 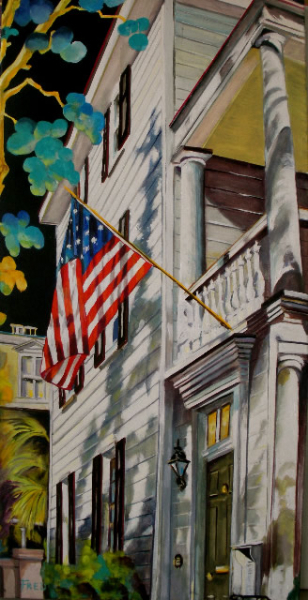 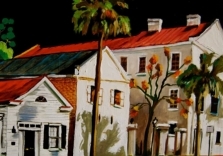 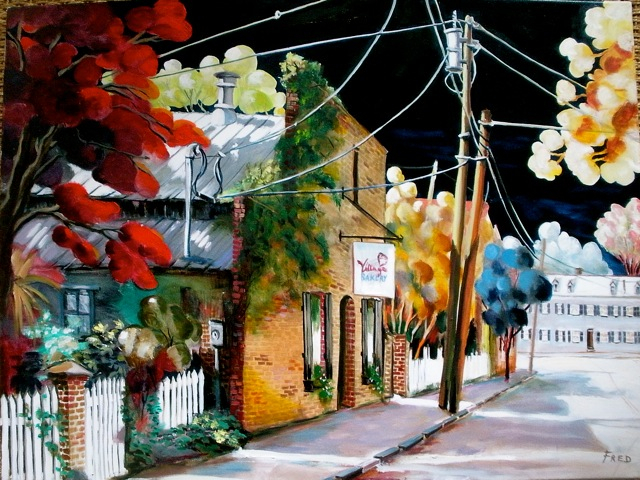 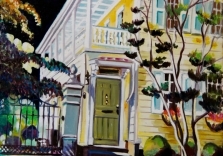 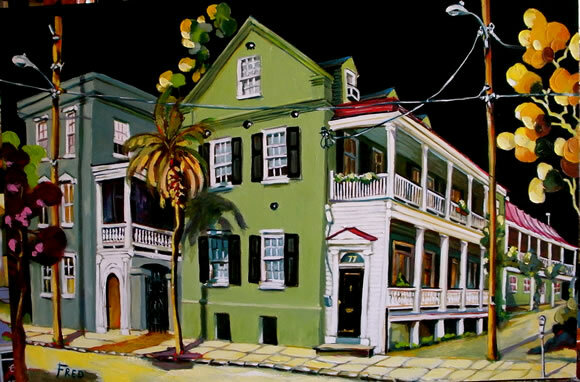 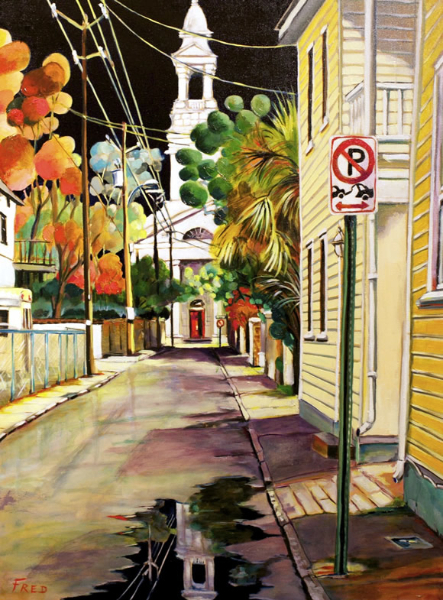 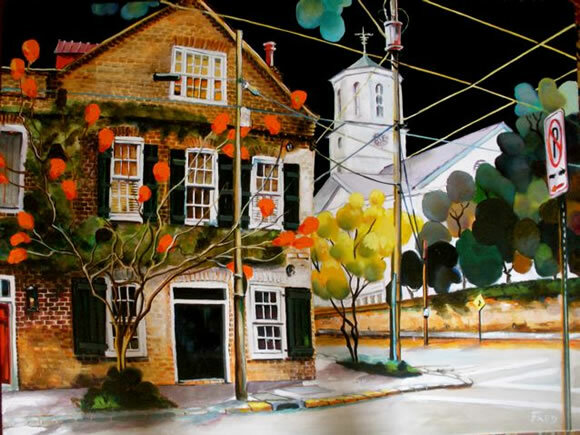 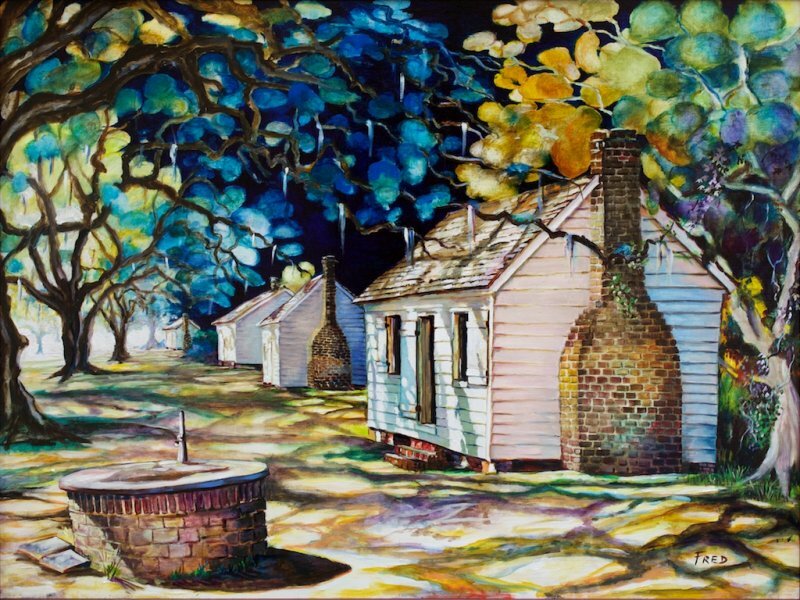 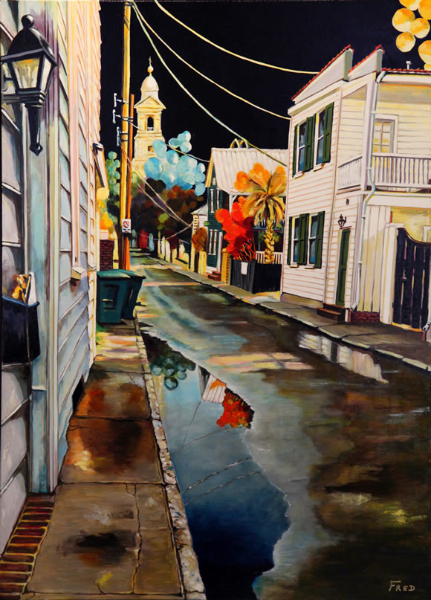 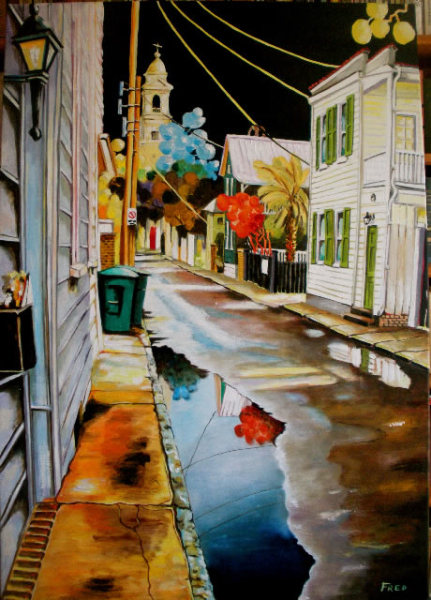 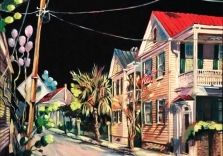 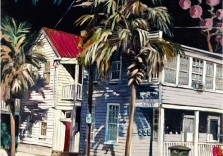 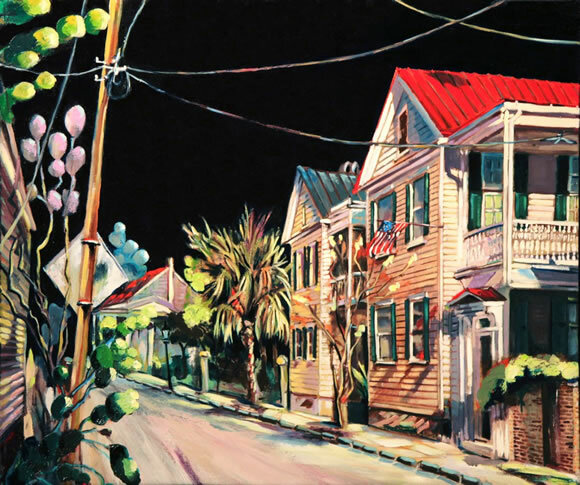 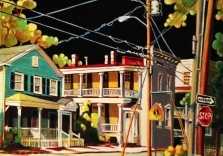 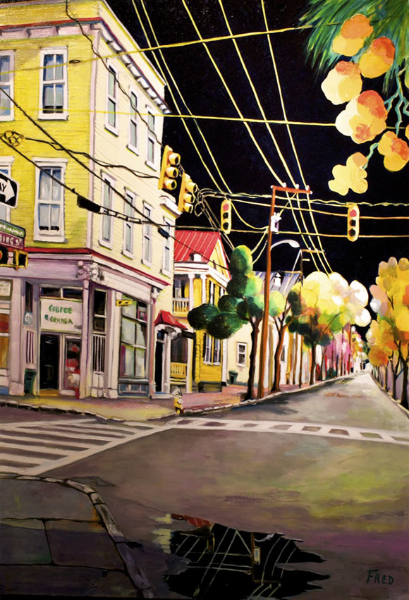 His recent work has been dominated by Charleston cityscapes - not seen, however, with the traditional eye. 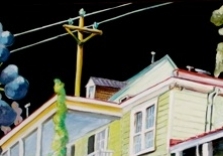 The sky is generally very dark, inky "Prussian" blue, and starless. 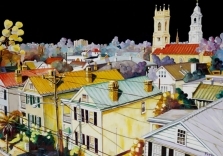 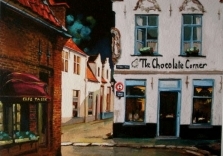 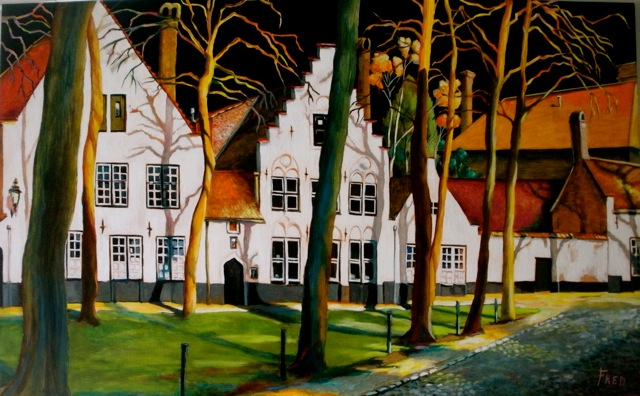 The trees are assembled color masses, balloon-like in appearance, and the buildings are intensely vivid in form and color, an impression heightened by the overhanging darkness. 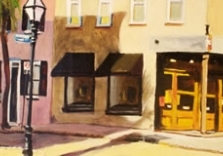 The paintings are bright - but also lonely. 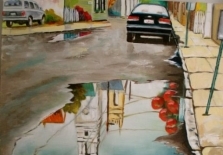 The mood is stock still. 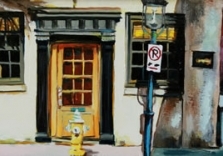 Most have no human or animal figures. 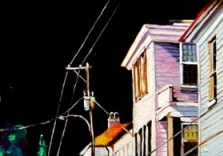 It is as if Edward Hopper painted an abandoned carnival at 3:00 A.M. 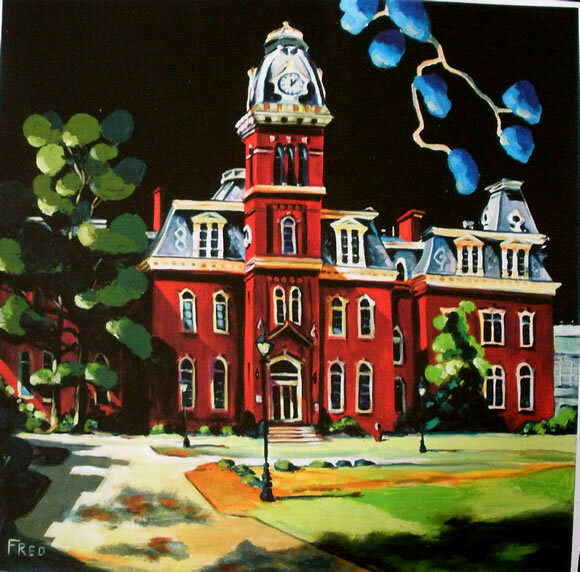 They are brilliant.